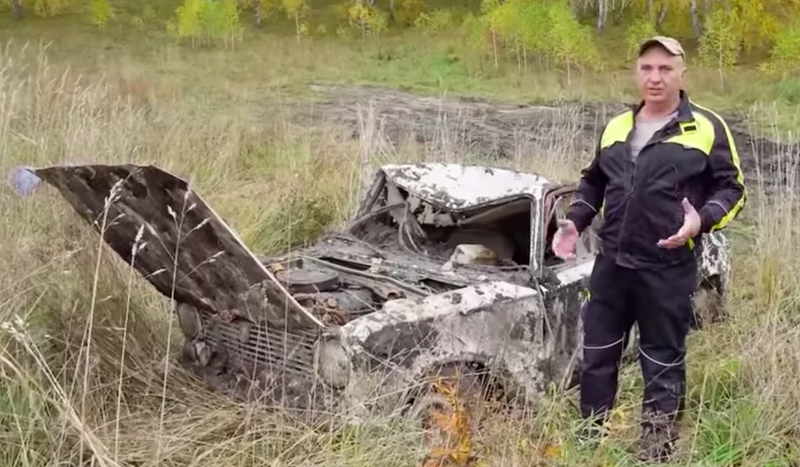 After burying three cars, and finding them to be totally ruined by the time he dug them up a year later, Vlad, host of YouTube channel Garage 54 ENG, decided to attempt to start the vehicles’ engines. Watch as the intrepid wrencher tries to bring life to machines that appear decidedly hopeless. Water in crankcases, mud in carburetors, filth under distributor caps, gunk all over spark plugs—these are some of the obstacles facing Vlad as he tries to fire up an old Toyota Corsa, Lada 1200, and Audi 100. Incredibly, Vlad gets the Lada fired up nicely, after draining the water, cleaning up the motor, replacing the carburetor mounting gasket, throwing in some new filters, and feeding that inline-four some clean gas. The Toyota also fires up with what appears to be nothing more than some cleaning, some new oil, and some clean fuel. The Audi’s engine, on the other hand, may never produce power again, as the starter motor—which was apparently finicky before the car ever went underground—no longer works, and Vlad ripped the carburetor off the motor during the extraction. Still, two out of three ain’t bad. Now hopefully he’ll try to drive one of them.